Just received some progress notes on the new Hatteras 100 Raised Pilothouse, which is scheduled to debut next fall. It shows lamination work on the hull with engineers and craftsmen laying in electrical, plumbing and propulsion systems. Special work has also gone into making the engine room a showpiece, featuring twin CAT C32A @ 1900 BHP marine diesels as the center of attention. The main deck and superstructure got finished in lamination followed by a complex rotation involving two gigantic cranes before being sent to the line. 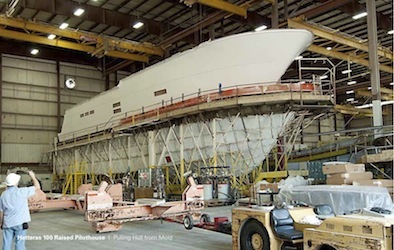 The cap for this beautiful new Hatteras is currently undergoing its finishing touches. The tooling department will soon complete the massive 80 foot flybridge mold and then send it to the lamination department for part construction….looks like that will be on schedule. As the larger pieces of the puzzle come together, several smaller ones have too. In the woodshop and finishing room, a number of the stateroom cabinets and dressers are done. The open-grain wenge is finished with a clear topcoat, to show off the wood’s natural color. The rich, dark wooden surfaces will be balanced with elegant dimensional doors and drawer fronts; accented with off-white padded-panels….Well done to the Hatteras team as we are able to see the process via their awesome progress images on this cool baby!